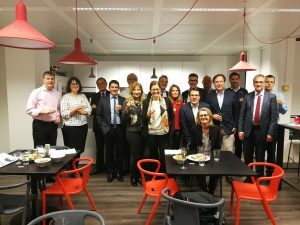 Last week took place in Brussels the meeting of the managing partners of the firms of TELFA (Trans-European Law Firms Alliance) to which Adarve has belonged for almost 20 years. The meeting was held in the offices of the Belgian firm CEW & Partners, which hosted this intense work meeting in which the attendees updated their work projects and the preparation of the groups of each speciality. The president of Telfa, Richard Isham of Wedlake Bell, UK, led the meeting in which he addressed the lines of work and strategies undertaken to strengthen this network of firms that for more than two decades has been an effective and quality alternative for those clients with multidisciplinary advisory needs in transnational issues or operations. Juan José García, Managing Partner of Adarve, participated in the meeting together with representatives of the offices of France, Holland, Belgium, Austria, Cyprus, Portugal, Norway, Slovakia, Germany, Estonia, Baltic States, United Kingdom and Belgium. The next General Meeting will take place in London from 24th to 26th May and will be attended by over 80 lawyers from the firms that make up Telfa and USLAW.